Ready, Set, Cook! 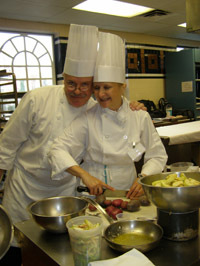 The Adventure Kids aka Debra C. Argen and Edward F. Nesta set off to Boot Camp, of the culinary kind, at The Culinary Institute of America (CIA) in Hyde Park, New York. The Two-Day Holiday Boot Camp put us through our culinary paces learning to create delectable fare just in time for the holidays. 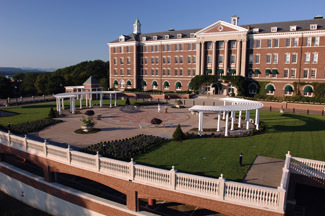 Founded in 1946, The Culinary Institute of America - The World's Premier Culinary College, is an independent, not-for-profit college offering bachelor and associate degrees as well as certificate programs in either culinary arts, or baking and pastry arts. 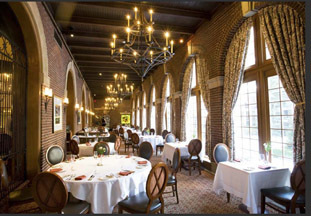 Located in the Hudson Valley of New York State in Dutchess County the school has an impressive roster of notable alumni that include Grant Achatz, John Besh, Anne Burrell, Rocco DiSpirito, Todd English, Sara Moulton, Roy Yamaguchi, and Enrique Olvera Figueras to name but a few, and is noted for its high standards and alumni success. Attending The Culinary Institute of America has always been a dream of ours, and since we are always looking to advance our culinary skills, when we saw that the school offered a two-day intensive training Holiday Boot Camp held in November 2009, we eagerly enrolled and learned the true meaning of Boot Camp, and happily survived to tell the tale. Day One: The program is listed as Boot Camp, and they were not kidding. Orientation for Boot Camp began promptly at 6:00 in the morning, and to get us in the spirit of our adventure, we felt like there should have been a bugler playing Revelry as we drove up to the impressive entrance of The Culinary Institute of America campus with its stately red brick and white buildings. Since it was still dark out when we arrived at 5:45 am, and we needed some additional rousing before class, we slipped in the CD O Samba Poconé by one of our favorite Brazilian rock bands, Skank, and after a few minutes of its pulsing and energizing rhythm we were ready for our day to begin. We proceeded to the East Wing Dining Room in the Continuing Education Building, and this being Boot Camp, we were provided with CIA logo duffle bags, which included coursework binders and our uniforms, namely "chef whites" consisting of a chef jacket, black and white checkered pants, and a white neckerchief, and said goodbye to our civilian clothes. Having given our sizes during pre-class registration, we eagerly went off to change into our official attire and our own non-skid shoes. 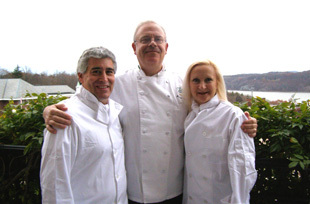 There is something almost magical about putting on a chef's outfit that triggers the culinary creative process, and with our neckerchief carefully knotted and our double-breasted chef jacket buttoned to the neck, we were dressed the part and ready to begin our first day of training. We began our day with breakfast, cooked by CIA students, eating in the main dining with its soaring ceiling and Tiffany stained glass windows, and getting to know our classmates. Our class of 12 consisted of 4 males and 8 females, all foodies, who traveled from New York, New Jersey, Massachusetts, Maryland, Texas, and Connecticut to attend the 2-day Holiday Boot Camp. Although intensive, our class had 2 Boot Camp returnees, one had taken the 2-day BBQ Boot Camp, and the other had taken the 5-day Culinary Boot Camp - Basic Training, which was encouraging to those of us attending The Culinary Institute of America for the first time. For some classmates, the Holiday Boot Camp was a birthday or a retirement gift, for others, it was a cooking vacation, for one it was a chance to increase his knowledge in the hopes of making a career change, and for the rest of us, it provided us with the opportunity to hone our culinary skills and learn new techniques with hands-on professional instruction from the chef demos. After breakfast, we headed to the Board Room for a 1-hour lecture and discussion from 7:00 am until 8:00 am with Holiday Boot Camp professor Michael Skibitcky, C.E.C, C.H.E., Assistant Professor in Culinary Arts, who like all of the professors at The Culinary Institute of America, is a highly credentialed chef with an impressive culinary background. Tall, mustachioed, blue eyes sparkling behind his glasses, Michael Skibitcky is the epitome of a chef instructor, tough enough to push his students to excel, kind enough to win their trust and respect. After his lecture and explanation of our 2-day program, we were divided into 4 teams of 3, and discussed which team member would be responsible for creating which of the 5 recipes required of the team. Each of the 4 teams would be responsible for creating 5 different recipes that would be enjoyed by all of the class as our lunch. Our team consisted of the two of us, and fellow classmate, Eugene, who had previously attended a 5-day Boot Camp. We would be responsible for creating Roasted Quartered Turkey with Pan Gravy; Cornbread Pudding with Apples and Sage; Garlic Roasted Potatoes with Rosemary, Sage, and Parsley; Glazed Carrots; and Apple Strudel. After checking the prep and time requirements for each of the recipes, we decided on an equitable division of labor with Eugene responsible for the Roasted Quartered Turkey with Pan Gravy; Edward would be responsible for the Cornbread Pudding with Apples and Sage, as well as the Glazed Carrots; and Debra would be responsible for the Garlic Roasted Potatoes with Rosemary, Sage, and Parsley; and the Apple Strudel. After a 15-minute break, at 8:15 am we made our way in our classroom kitchen where we were provided with long white aprons, toques, and kitchen towels. After an orientation of the large classroom kitchen, by 8:30 am we took our places at our set-ups and started our prep and gathering the ingredients that we would need for our recipes. That accomplished, it was time for one, two, three, cook! While everyone in the class had home cooking experience, learning to cook and work in a professional kitchen with 12 other students running about gathering ingredients and fighting for stove and oven time, and an Executive Chef barking out times to keep us on schedule was a new experience for almost all of the students. Chef also walked around reminding students to keep their jackets buttoned up and their aprons on, not only to create a professional appearance, but also because they protect the body against spills and burns, and anyone whose hair hung below their collar or any ponytail hanging outside their jacket was teased that the chef was going to get his scissor, prompting students to quickly secure their hair under their toques; this was Boot Camp and our foray into what it takes to work in a professional kitchen. It was an exciting morning as Chef Michael Skibitcky not only put us through our paces to produce well-executed recipes, but he also provided us with demos throughout the morning so that each student could learn different techniques of poultry "boning out," butterflying, quartering, stuffing and rolling a turkey roulade, making a terrine, and pie dough techniques, even if another team was responsible for the execution of the actual recipes. By the time 12:30 pm rolled around, the kitchen aromas were tantalizing as we plated our presentations for Chef's inspection. 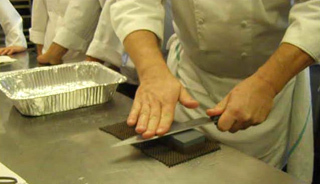 Although many of the recipes that the class had to create challenged skill levels, that was the purpose of the class, which was to teach new skills and techniques, and when Chef Michael gave his approval on the final presentations, hearts soared with newfound confidence. Sitting in the dining room surrounded by fellow classmates, other CIA students, faculty, and visitors, while eating our classwork for lunch, everyone was flushed with pride over their accomplishments. After a rewarding lunch and time to unwind we were back in the kitchen with Chef Michael as he reviewed our morning accomplishments and areas of improvement. He fielded questions on subjects ranging from the cooking time for goose, to how to sharpen a knife that came with a hands-on demonstration. Chef Michael concluded the afternoon with a demonstration on how to prepare a loaf pan to make a pâté en terrine that included greasing the sides of the pan then lining the vessel with plastic wrap, smoothing it out with your hands and finally adding water which would remove all the air pockets creating a smooth finish to whatever type of terrine you were making. 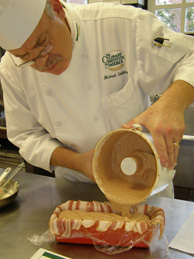 Chef Michael proceeded to make a goose liver Foie Gras pâté en terrine that was lined with bacon. The class awaited the final product that would be sampled as part of our Day 2 lunch. It was indeed an enlightening and exciting first day of class at The CIA. As part of our tuition, in the evening we had dinner at the award-winning American Bounty Restaurant, which is one of the restaurants at The Culinary Institute of America that is open to the public and is where students prepare and serve American regional cuisine as part of their degree requirements under the watchful eyes of Theodore Roe, CIA '91, C.H.E., Chef-Instructor, and Heather Kolakowski, CIA '02, C.H.E., Maitre d'Hotêl Instructor, and Dwayne LiPuma '86, C.H.E., Assistant Professor in Culinary Arts, and Damir Juric, Associate Professor, Maitre d'Hotêl Instructor. A few of the highlights of our dinner included Slowly Simmered Beef Short Ribs with Soft Polenta, Sun Dried Tomatoes, and Mascarpone; Maine Lobster "Burgoo" with Chanterelle Mushrooms, Autumn Vegetables, and Carrot Froth; and Ice Cream-filled Profiteroles with House Churned Ice Cream, Chocolate Sauce, and Candied Almonds. American Bounty Restaurant is open for lunch Tuesday through Saturday from 11:30 am until 1:00 pm, and for dinner Tuesday through Saturday from 6:00 pm until 8:30 pm. The American Bounty Lounge is open from 6:00 pm for guests with dinner reservations. The restaurant is closed from December 19, 2009 until January 5, 2010. To make a reservation at American Bounty Restaurant, please call Monday through Friday between the hours of 8:30 am until 6:00 pm, or visit the restaurant website at: www.CIAChef.edu/Restaurants/Bounty. Day Two: By now we felt like the professionals that we were becoming, at least we looked the part dressed in our chef whites, and we now knew our way around the classroom kitchen and where to look for special ingredients as well as equipment. Our day began with breakfast in the dining room, followed by another 7:00 am lecture and discussion. Remaining in our original teams, each team was once again responsible for creating their part of the culinary feast. 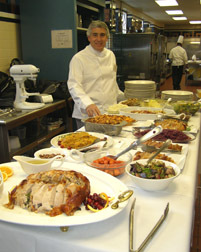 Our task for today was creating Roast Rack of Lamb with Rosemary; Risotto with Porcini Mushrooms and Basil; Haricot Verts with Almonds; Turkey Wild Rice Soup; Roast Turkey; and French Vanilla Ice Cream. Day Two's assignments were more involved, and after reviewing the prep time needed, we divided our recipes among the three of us; Edward would be responsible for the Roast Rack of Lamb with Rosemary and French Vanilla Ice Cream; Eugene would be responsible for the Turkey Wild Rice Soup; and Debra would be responsible for the Roast Turkey; Risotto with Porcini Mushrooms and Basil; and Haricot Verts with Almonds, with Eugene also helping as needed. 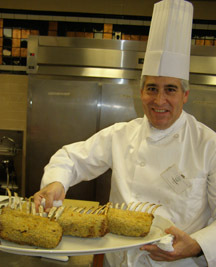 In between preparing our recipes, Chef Michael Skibitcky provided the class with demonstrations on tying a roast, frenching a lamb rack, trussing a goose, making rolls, and making sausage. All of this information was enough to make our heads swim and our eyes roll around like cartoon characters as our brains tried to interpret and remember each new skill and each new technique that we learned. Another lesson learned by the students was camaraderie, not only among team members, but also the ability of working harmoniously with the other teams, as the students learned that to have a successful kitchen, everyone must pull together and help one another out to produce an end product for which everyone would be proud. By 12:30 pm, the class was exhausted yet exhilarated at what we had accomplished as we proudly displayed our enormous feast of appetizers, salad, soup, multiple entrees, side dishes, and desserts waiting for Chef's approval. Over lunch in the dining room, we toasted to all of our successes. We proceeded to a class room for a debriefing and a review of our two days of accomplishments; there was an air of satisfaction as everyone discussed the various dishes that they prepared. The two days of classes concluded with a tour of the facilities at The Culinary Institute of America, which was an amazing look behind the extensive and diverse training of being a chef as well as a behind the scenes view of the complex world of ordering and supplying a facility such as The CIA. At the end of the tour, we said our goodbyes to our classmates who would not be able to stay for the last dinner. In the evening, we returned to The Culinary Institute of America for a celebratory dinner at the elegant Escoffier Restaurant, also one of the award-winning restaurants open to the public, where students prepare and serve French cuisine as part of their degree requirements under the watchful eyes of Alain V. DeCoster, C.E.C, C.C.A., Chef-Instructor, and Douglas D. Miller, CIA '89, C.H.E., Maitre d'Hotêl Instructor. A few of the highlights of our dinner at Escoffier Restaurant included Côtelette de Marcassin, Champignons des Bois, Gratin Dauphinois (Wild Boar Center Cut Chop, Seasonal Mushrooms, and Au Gratin Potatoes); Sole de Douvres à la Meunière (Comme Julia l'à Découverte), (Dover Sole Meuriere (Just Like Julia Discovered It); and Homard Thermidor (Gratine of Lobster in its Shell). After a tour of the Escoffier Restaurant kitchen and meeting Chef Alain V. DeCoster, it was time to say goodbye to our new friends, and to savor our memory of attending The Culinary Institute of America. Although it was challenging at times, it was definitely a rewarding experience that provided us with increased skills, and whetted our appetite to return to the school and take other classes in the future. Bon Appetit! Escoffier Restaurant is open for dinner Tuesday through Saturday from 6:00 pm until 8:30 pm. The restaurant is closed from December 19, 2009 until January 5, 2010. 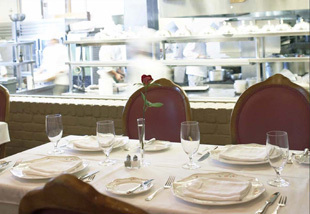 In late January 2010, Escoffier Restaurant will also be open for lunch from 11:30 am until 1:00 pm. To make a reservation at Escoffier Restaurant, please call 1-845-471-6608 or visit the restaurant website at: www.CIAChef.edu/Restaurants/Escoffier. 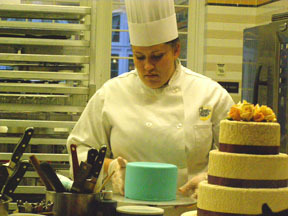 In addition to their professional career culinary curriculum, The Culinary Institute of America offers a diverse curriculum of Two-Day, Three-Day, Four-Day, and Five-Day Boot Camps, as well as Weekends at the CIA: 1-day cooking classes held on Saturday or Sunday. 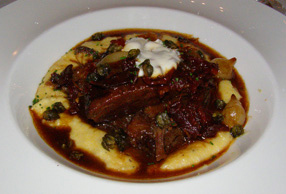 In addition to the Hyde Park, New York location, The Culinary Institute of America also has locations in St. Helena, California, and San Antonio, Texas. 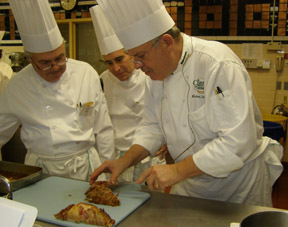 For additional information and program schedules, or to make a reservation at one of their award-winning restaurants, please visit The Culinary Institute of America website at www.CIAChef.edu or call them at 1-800-888-7850. Read other articles on The Culinary Institute of America in the Restaurants and Chefs' Recipes sections. Please read about Dutchess County in the Destinations, Hotels and Resorts, and Restaurants sections. For information on Dutchess County, please visit the website: www.DutchessTourism.com, or call them at: +1-845-463-4000, or Toll-free in the United States at 1-800-445-3131. © December 2009. Luxury Experience. www.LuxuryExperience.com All rights reserved.